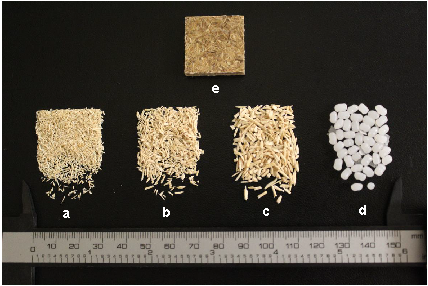 Keywords: barley straw, experimental design, particleboard, recycled HDPE, waste. Barley straw (BS) and recycled high-density polyethylene (rHDPE) are wastes that representan environmental problem due to the large quantities that are generated each year and not subject to recycling processes. In this study, both residues were usedin the manufacture of particleboard. The aim of this research was to characterize the mechanical and water resistance properties ofpanels, modifying its particle size (0.425, 0.60 and 1.00 mm), bonded with rHDPE by three content levels (40, 50 and 60%). Also, a center 23experimental designs and was employed. The evaluated water absorption (WA) and thickness swelling (TS) after 2 and 24 h were measured to determine the dimensional stability of the particleboards. The evaluated mechanical properties were the modulusof rupture (MOR) and modulus of elasticity (MOE). The results showed that particle size and components proportion were significantly influencing both mechanical and physical properties. The WA and TS decrease proportionally as the particle size and the content of rHDPE increase. The MOR and MOE are negatively affected by an increase in the content of rHDPE and the particle size. Wastes that BS and rHDPE can be used to manufacture value-added particleboards that meet quality standards.